Noting that most island economies in the Caribbean are based on highly climate-sensitive industries and sectors like tourism and agriculture, Tourism Minister Hon. Edmund Bartlett says the region’s media have an important role to play as a contributor to the local, regional and global discussion on climate change. 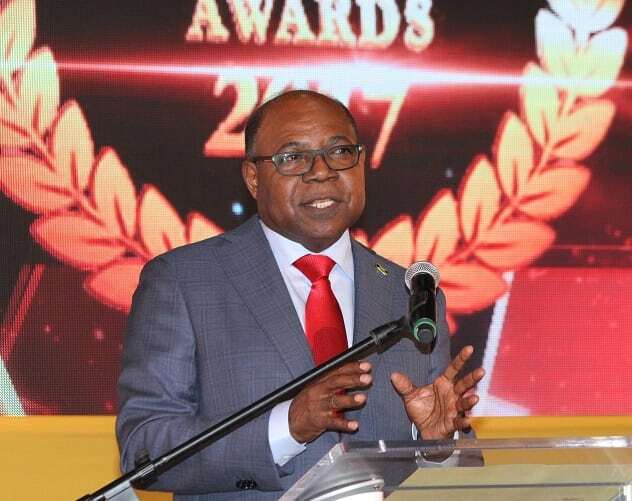 Minister Bartlett was giving the keynote address at the CBU 2017 Caribbean Broadcasting Awards on Tuesday night (August 14), at the Courtleigh Auditorium, New Kingston. “Climate change is a complex issue with enormous political, social and economic implications. There is much work to be done to shape public perception and understanding of this issue while helping to shape policies and encourage policymakers to act,” the Tourism Minister said. “At the same time, effective mitigation of climate change is a process rather than an outcome and media can play an integral role each step of the way. You must be advocates. You must be watchdogs. You must be the facilitators of change,” Minister Bartlett continued. He noted that Caribbean media organizations are in a powerful position to instigate positive debate and shape what people think, feel, and do about climate change and building resilience to its impact. Recalling the devastation of the 2017 Atlantic hurricane season, the Tourism Minister said it underscored the Caribbean’s major stake in the climate change story. Economic losses exceeded $100 billion, with GDP losses ranging from 10 percent to 224 percent in the case of Dominica. He said that according to a World Travel & Tourism Council industry study, the 2017 hurricane season resulted in an estimated loss of 826,100 visitors to the Caribbean, compared to pre-hurricane forecasts. Those tourists could have spent US$741 million and sustained more than 11,000 jobs. In closing, Minister Bartlett invited the CBU to partner with the Global Tourism Resilience and Crisis Management Centre in building the capacity of Caribbean islands to not only withstand disruptions but also, most importantly, to bounce back and thrive after a disruption. The Centre was one of the major outcomes of last November’s UNWTO Global Conference on Sustainable Tourism in Montego Bay. It will assist with destinations preparedness, management and recovery from disruptions or crises that impact tourism and threaten economies and livelihoods. These include climate change and natural disasters, cybercrime, cyber-security, pandemics, terrorism and war. It will be located at the University of the West Indies (UWI), Mona, and will be operational in September and launched officially in January 2019. “The most important function for that Centre is going to be communication; getting the information out in a coherent fashion, to be able to stay on message and enable the world to understand what is happening in the Caribbean when these disruptions take place,” the Minister said. As a precursor to the Centre’s soft opening on September 13, Jamaica will host a resilience summit with key global stakeholders and thought leaders at the UWI, under the theme ‘Tourism Resilience through Global Synergies’. It was quite hard for members of the jury to choose a winner for the kiosk competition organized as part of the Praslin Culinary and Arts Fiesta over the weekend. Villa Bodhi in Bali, Indonesia, was nominated to be added to THE LIST by eTurboNews.